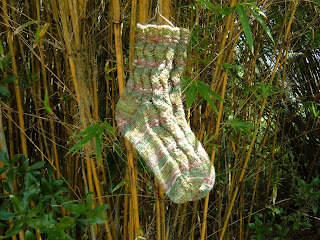 This has been a fun few days using up all the leftover sock yarn--it is a delight to the eyes, isn't it? Maybe I should have titled this 'ankles and wrists'. The orange and teal wristlets have been simmering in me for a long time, since I saw an example of 2 color work in SpinOff magazine using 2 opposing colorways--it was as satisfying as I had hoped! I do not think I am done with the experiment and can already see some more lovelies in the works! company? This is Bling (named for his golden color and his love of anything shiny). 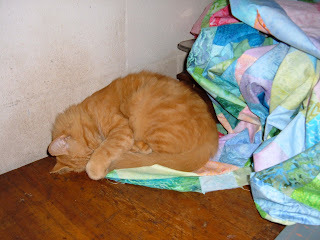 He likes to be on whatever I am doing-I am accommodating ; I was still working on the other end of this quilt piecing the rows together and I didn't bother him at all! Who needs to wait for a quilt to be finished to appreciate it? 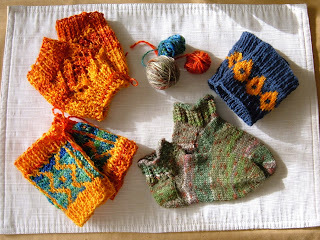 I finished my socks for the Favorite Socks KAL while sitting and watching the 'workermans' put in our new driveway. This is another superwash that I dyed and spun. 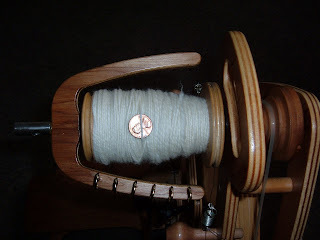 It is a good day when you get to finish something and it is always fun to start something new-I am going back out to watch and do some spinning. I received some lovely samples from Michele at Juniper-Designs and will enjoy spinning them! and to replace our old above ground. It is so good to be making progress! I have tried a new fiber and I love it! 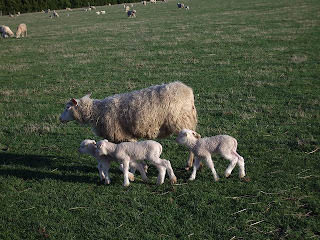 It is wool from a Finn sheep, very long fibers with a nice sheen so the finished yarn has a luster! 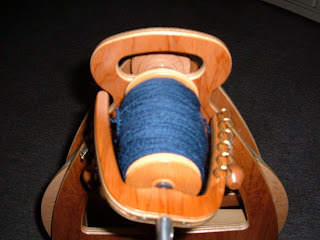 The fiber spread out is to show you how I separate it before I spin it. I split the whole roving into 2 equal parts and put one away-this will be the second skein. 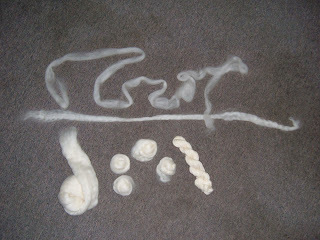 I then split the remaining roving into 2 equal parts and set one aside for the second bobbin. The remaining section I separate into 6 parts along the length of the roving this time and wind them into little nests-these will be spun onto the first bobbin. I pick up a fluff ball and gently pull the fiber apart (called predrafting) to make it thinner and much longer-at least twice as long as the little nest was previously. Now, I spin! See my breathing slow, see my hands and feet work into a perfect rhthym that will transform this fluff into yarn-truly an amazing art. Give it a try if you ever have the opportunity to-don't miss the chance due to any excuse! This is what I have been building lately-this pieced top will be a wall hanging. I used a computer printed image on fabric--completely different than anything I have tried before. It is very free form and it was hard not to be in the 'exact points match etc' mode but it was also very liberating! 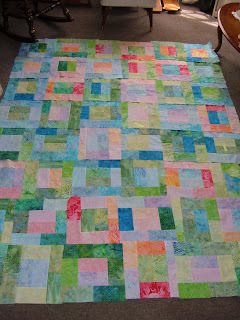 The bed size quilt is not sewn together yet, I just finished piecing the blocks last night. 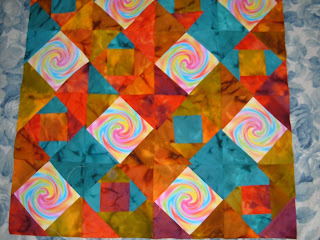 It is a fat quarter kit that is beautiful Batiks and was easy to piece with dramatic results! Even DH says, "Wow!" 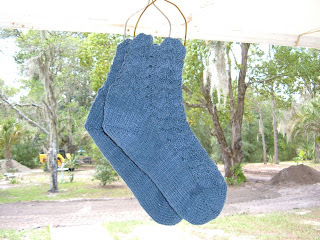 I am also knitting up the blue wool into socks in the evening; I had many false starts with this pattern from the Favorite Socks Knit-a-long....it has been very good to stretch my comfort zone in knitting and quilting-change can be good when you are ready for it.........! 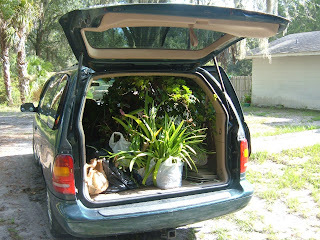 Good friend, Becki, always sends us away after a visit with a carload of plants-she has a very green thumb............so far we have been accumulating the plants in pots and harboring them at the side of the house until we could think of a safe place for them with the construction ahead. This week we decided to give some of them a home in the only area we are pretty sure will be safe for a while-our driveway 'island' (the driveway loops around this area). 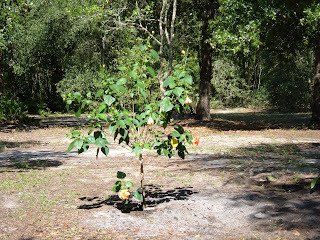 It has been fun to plant and help the area that once was flourishing to be restored to lush growth-now we are talking about future lush 'cuz every gardener also has to have vision and as we plant, we see not the single stalk before us but the huge, full, green shrub that it will be! 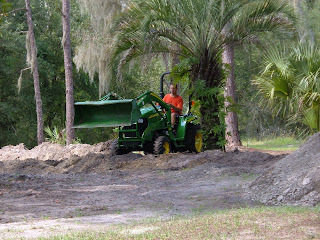 We only work for a few hours in the morning while in the shade and before the sun gets to full baking strength! 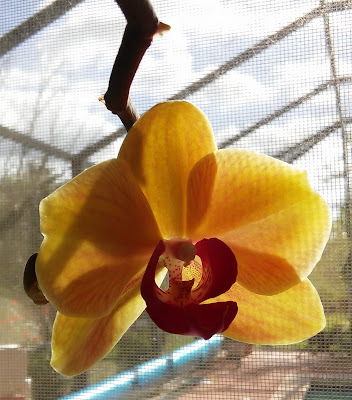 I can tell 'cuz it is still blooming ...............since May! Just beautiful! Thank you one and all. 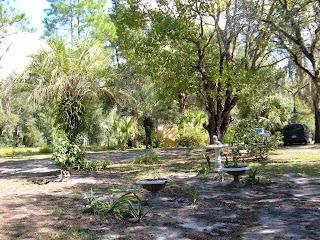 The super heat of summer has broken and it is nice to be outside working in the yard again! (Isn't it funny to be calling 90 'cool again!') I have been dyeing some superwash wool roving and then spinning it for the past week-I will begin knitting tomorrow as soon as the wool dries-it is the finest sock yarn I have spun yet. (This is not refering to the quality but rather to the thinness of the yarn for you non-knitters!) I was hoping for a little more dimension in the color but it is still a pretty navy color-I am hoping some of the variations of tone will show up when knitting. New skills require a definite learning curve. I know enough to be patient with myself and the fact that nothing is 'ruined' in the process sure does help! Waving Lace is Finally finished! It has been a challenge for some reason-- You would never guess the rip-outs on this one! I really needed to be focused and alone when I knit these. I did watch and old movie and manage to crank away to get the second one done. As always, it is worth it when you see the end results. I made these pretty much as directed by the pattern instructions. The yarn is Step by Austermann in greens. It is a superwash that is made with aloe and jojoba oil in the yarn for a beauty treatment for your feet-will let you know how it holds up!